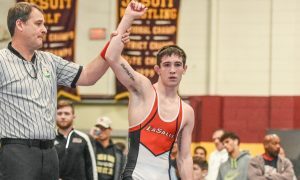 Wisconsin continues its run of strong recruiting under first-year head coach Chris Bono with a verbal from Illinois state champion Peter Christensen of Montini Catholic. 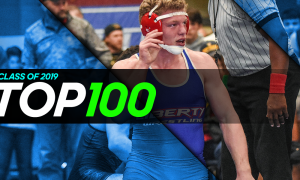 Peter is currently the 27th ranked wrestler overall in the Class of 2019 and third at 195 lbs. This summer Christensen was a Junior Freestyle runner-up in Fargo and also seventh in Junior Greco-Roman. Before Fargo, Christensen went 4-1 at Junior Freestyle Duals, losing only to second-ranked Jacob Cardenas (Bergen Catholic, NJ) by a point. At the UWW Cadet Freestyle World Team Trials, Peter lost an opening round match to Konner Doucet (Comanche, OK), a wrestler he would go on to drop in the Round of 16 in Junior Freestyle in Fargo. Christensen would go on to take fourth at the WTT’s. He projects to be a 197 lber which fits well, as it appears to be a long-term need for the Badgers. So far this recruiting season Bono has gotten commitments from three members of the Class of 2019 and one from the Class of 2020. Christensen is the first from either class to come from out of state. South Dakota State also received a huge commitment from Cade DeVos (Southeast Polk, IA) the 52nd ranked wrestler in the Class of 2019. Cade also ranked ninth in the nation at 145 lbs. Like Christensen, DeVos has had a busy summer with placements at some of the toughest tournaments in the country. DeVos was also a double All-American in Fargo, placing seventh in the Junior division in both styles. Cade also competed in the UWW Cadet WTT’s, taking fifth-place at 65 kg. DeVos picked up a pair of championships at the Northern Plains Regional, in both freestyle and Greco. During the high school season, DeVos captured his first state title for Southeast Polk, after losing in the finals as a sophomore. Cade is the second Iowa native to commit to the Jackrabbits and new head coach Damion Hahn this summer, joining Skyler Noftsger (Ballard, IA). One has to assume that assistant coach Cody Caldwell, as an Iowa native and former Northern Iowa wrestler, played a role in these commitments.